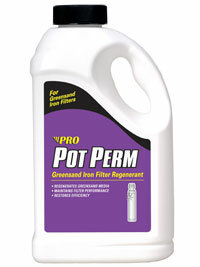 Pot Perm maintains performance of greensand iron filters. It is an iron filter regenerant and strong oxidizing agents which helps to convert dissolved iron and/or manganese to insoluble oxides, allowing the filtration to easily remove them. By regenerating and oxidizing the greensand iron filter media, the exchange capacity of the unit is restored. Lab test confirm Pot Perm to be more efficient at maintaining performance in greensand iron filters. The dosage and setting on your iron filter will remain the same. 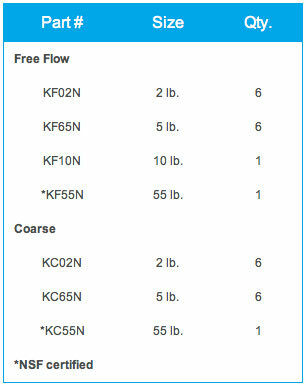 Available in 2 lb, 5 lb, 10 lb & 55 lb sizes. 2-4 oz. of dry Pot Perm iron filter regenerant is recommended for every cubic foot of filter media. The product may be added directly to the filter or mixed with water and then added as a solution. At room temperature, 8oz of Pot Perm will dissolve in one gallon of water. For regeneration information, consult the iron filter manufacturer.